Hundreds of Muslim youths hit the streets across the UK with litter-pickers and bin bags on 1 January 2019 as part of a nationwide AMYA initiative. 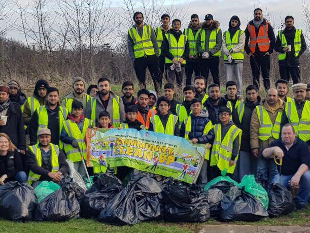 Hundreds of Muslim youths hit the streets across the UK with litter-pickers and bin bags on 1 January 2019 as part of a nationwide AMYA initiative to help keep Britain tidy after the new-year festivities, and Hounslow was no exception. A group of sixty young people from all over Middlesex from the Ahmadiyya Muslim Youth Association (AMYA) came to Hanworth Park, in Hounslow to litter-pick and street clean Elmwood Avenue and Hanworth Park all the way up to Hanworth Park House. Blessed with good weather conditions, the group began their clean-up at 9 am at Hanworth Park by Elmwood Avenue. Members of the public were invited to join in, and refreshments were provided. The operation was very well received by the public, who lent the group their support, wishing them a Happy New Year and thanking them for their efforts. Along with members of the public who joined in was local Ward Councillor, Cllr Hanif Khan. Together the group filled a total of 22 bags of rubbish between 9 am and 10.30am.